Immediate implants are dental implants that are embedded within the same day after affected teeth are extracted, providing immediate aesthetic and functional improvements for missing teeth problems. Also called same day dental implants or All on 4 implants, this type of implant treatment makes it possible for the benefits of the implants to be enjoyed after a single dental visit, and without the need to wait for a few months for the entire treatment to be completed (and for the dental restorations to be attached to the actual implant). The dental restorations (such as dental crowns or a dental bridge) can also be attached to the implant within a few hours – providing brand new smiles after just one dental appointment. The immediate dental implant system by Nobel Biocare is one of the most well-known and most trusted when it comes to the All on 4 dental implant treatment. However, this particular method of loading the implants immediately after tooth extraction, and the subsequent attachment of the dental restorations, is not for everyone with missing teeth. Your dentist will need to determine first your suitability for this treatment prior to the formulation of the treatment plan, and the actual loading of the implants. Just like a traditional dental implant treatment, the immediate implant procedure starts with obtaining images (x-rays, CT scans) to determine the suitability of the treatment to the jaw bone condition (where the implants will be placed); this is because not everyone who has missing teeth can have same day implants. The images obtained will be needed to come up with a high degree of precision when it comes to the treatment plan to be formulated, and for the actual placement of the implants in the jaw bone. The dental implant will be embedded into the jaw bone right after the affected tooth is extracted, replacing the function of the lost natural tooth. A dental crown or a dental bridge can then be attached within the same day, providing missing teeth solutions and replacing both the form and the function of natural teeth that have been lost. Immediate implants provide all the benefits of a dental implant treatment within a few hours after tooth extraction – within the same day when the implants are attached to the jaw bone. With a same day dental implant treatment, you can look forward to enjoying a brand new smile after just one dental appointment, eliminating the need to wait for a few months for the entire implant treatment to be completed. Who Can Have Immediate Implants? Immediate implants are for patients with missing teeth who have good jaw bone structure, as the stability of the implants will depend on the good quality of the jaw bone. This type of implant treatment will also be suitable for those who have good overall dental health, as well as good gum structure. Immediate Aesthetic Improvement – Immediate implants provide instant aesthetic improvement, as the implants and dental restorations can be attached (and enjoyed) within the same day of the dental appointment. Shorter Treatment Time – This type of implant treatment eliminates the need to wait for a long time for the implants to be completely healed, before they can be attached to permanent teeth restorations. 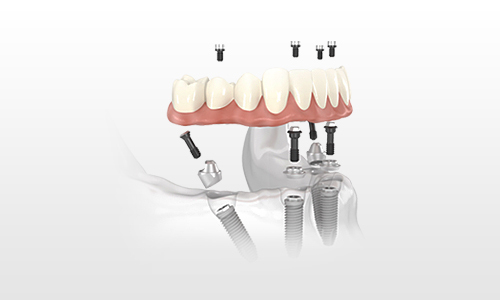 Immediate Functional Improvement – The function of the implants as missing teeth replacements can immediately be used and enjoyed with same day implants.